All My Love Berries is rated 5.0 out of 5 by 4. Rated 5 out of 5 by Journey_On from Great product I bought this for my mom for Mother's Day. She loved them, and they were eaten within a few days! Rated 5 out of 5 by Manuel from Cheery Berries This gift was very well received and appreciated by the recipient. Rated 5 out of 5 by Baby doll 02 from All my love berries I bought these for my sister's Mother's day gift and she loved them! Thank you for my surprise being perfect!! Rated 5 out of 5 by Babs12 from Happy Mother!! My Mother called to say she had received her chocolate covered strawberries and she was so pleased with them. She said they were not only delicious but they were beautiful! Thank you All My Love Berries, I have a very happy Mother for Mother's Day! 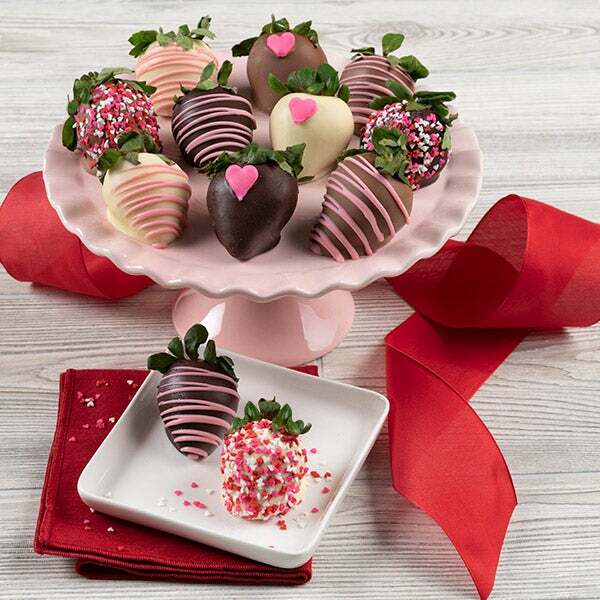 There’s no better way to express your love on Mother’s Day than with these luscious berries! Hand-picked strawberries are selected at the peak of their freshness and then dipped in decadent Belgian chocolate. Each berry is lovingly decorated with candy sprinkles, pink hearts, and swirls of pink and white chocolate. Mom will definitely feel the love when you send her these berries.